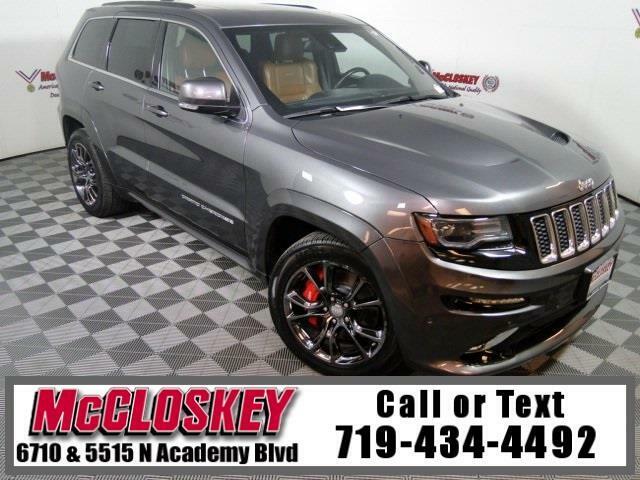 BEASTLY 2014 Jeep Grand Cherokee SRT 4x4 with Navigation System, Track Package, Launch Control, Panoramic Moon Roof, 6.4L HEMI V8 Engine, and Heated and Cooled Leather Seats! You also get an exclusive V8 engine, 20-inch forged wheels, LED running lights, an adaptive suspension, performance-tuned steering, Brembo brakes, a limited-slip rear differential, leather/suede sport seats and carbon-fiber cabin accents. The SRT comes exclusively with a 6.4-liter V8 that produces 470 hp and 465 lb-ft of torque. The 2014 Jeep Grand Cherokee SRT is a tower of power that accelerates and stops at rates that will impress even the most seasoned sports car driver. It's a sleeper performance vehicle if ever there was one.